Date of introduction: 1988 Display technology: n.a. Size: 12.0" x 21.5" x 1.7"
Texas Instruments introduced with the Super Speak & Read a combination of the previous Speak & Read and the position sensitive keyboard of the Touch & Tell game. The game could be opened and one of the supplied small booklets inserted. The integrated voice synthesizer will ask you different questions and you have to show with your fingertip the answers. Dismantling the toy reveals a smart internal construction with just a TSP50C42 Speech Synthesizer and a TSP60C80 Speech-ROM. 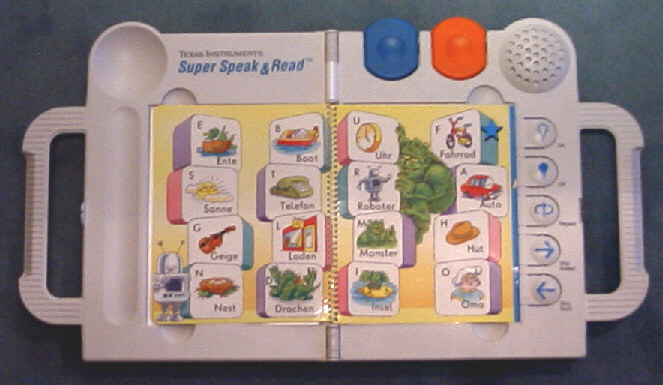 The Super Speak & Read uses exchangable Speech-ROM's in an expansion port. Each of them corresponds to a set of different booklets. Three different modules with a total of 18 booklets are known. Up to now we don't know the differences to the Ready...Set...Read!. The picture on the left side displays the game in the opened state. Find a picture of the closed box here. The toy is intended for players ages 3 to 7. The Super Speak & Read got later a smaller sibbling with identical booklets and hardware, the Magic Reading Desk. Don't miss the related Touch & Discover and the smaller Teddy Touch & Tell. The Super Speak & Read is featured in the Texas Instruments Incorporated leaflet Follow the Learning Path™ dated 1991.